Created by Mr. Makoto Yamaguchi, one of Japan’s foremost origami creators, in response to the devastating disasters in Japan in 2011, Origami Caravan is a humanitarian effort especially for the children in the Sendai area. Founder of Gallery Origami House in Tokyo, Yamaguchi-san is also a prolific origami book publisher and mentor to folders around the world. The original plan for Origami Caravan was for members of the origami community to visit the disaster centers mostly affected and bring origami book and paper donations to share and lift the spirits of those survivors. It became clear after several trips to the various centers that more was needed. June Sakamoto and Vicky Mihara Avery began a campaign to raise funds from Americans through their origami events selling models with permission from the creators and teaching origami to the public at local festivals and fairs. They received several generous donations from individuals and all funds were delivered in person to Mr. Yamaguchi in Japan. Mr. Yamaguchi decided to focus his attention on the newly orphaned children who lost their parents in the tragic events that struck the area. He has sent the donations we collected from donors in the US as well as from various individuals and organizations in Japan. We knew that the orphanage would need more help so we came up with an idea of holding an online auction in which everyone around the world could participate. Although this auction is the first of its kind, it will NOT be the last. Another auction is being planned for next spring to commemorate the first anniversary of Japan’s disasters. Different origami models by different creators will be featured. This will keep the bidding active and interesting. 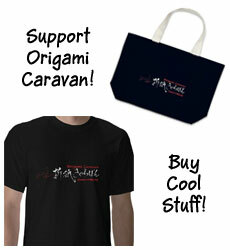 We plan to continue the Origami Caravan Auction (OCA) with the Japanese orphanage as beneficiary indefinitely for now. However, should the need arise in another part of the world, the funds we raise for OCA can be channeled to where it is needed most. This is a “win-win” situation — the creators are donating their models to a good cause and those models are available to the origami community who can all have an opportunity to bid on them! What a wonderful way to excite the origami community and get the “juices flowing” in the origami creator circles! This is truly a full-circle situation of Origami: Origami models BY Origami creators FOR Origami donations FROM origami enthusiasts TO Origami for Japanese children. A huge hug to all the origami creators who agree to participate in this project and the people who bid on them. Origami is NOT just folding paper — it is a way to reach out to another person. Thank you for helping us make a difference!